USC really drives the tradition of west coast football. With their first squad fielded in 1888, Southern Cal is a team that sets a standard for others not only near the Pacific, but nationally. USC is one of those places that define tradition. An illustrious history includes coaching legends, Heisman Trophy winners, national championships, and classic rivalries (Notre Dame and UCLA most notably). In the past four weeks, the embattled USC program has suffered three crushing defeats and the dismissal of their head coach. So, why were they favored over #3 and undefeated Utah? USC always can boast these assets. The Rose Bowl is known as the “granddaddy of them all” because of its prestige, rich history, and striking beauty. Set amongst the San Gabriel Mountains and placed in the ritzy neighborhoods of the Arroyo Seco, the setting is timeless and leaves a lasting impression. Arguably college football’s most picturesque view occurs as the sunset illuminates the mountains adjacent to the Rose Bowl, while outlining this colorfully grand arena. It’s one of perfection’s rare visits. 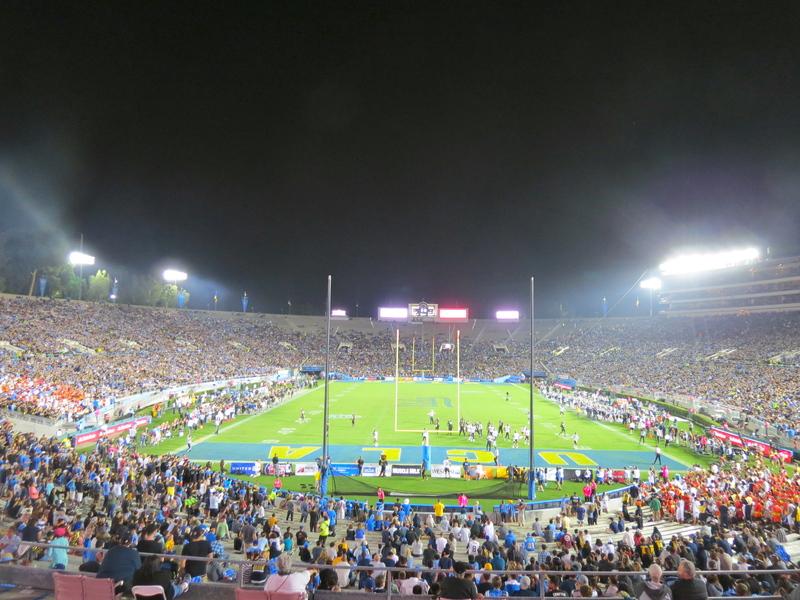 A Rose Bowl black out set the stage for the Bruins, who were in must-win mode. A season filled with playoff aspirations has taken a few punches to the jaw. A win over the ranked Cal Bears would bring a little more postseason attention in UCLA’s direction. Looking down from high atop Sentinel Peak (“A” Mountain), widespread afternoon views of Tucson lie below. Looking up at this peak from campus, the rock-formation “A” is a beacon of pride for Wildcat fans. Even though night games are a common trend at Arizona, gameday action builds a grand crescendo all day long. 77 points – record. 499 rushing yards – record. 792 total yards – record. Thank you for visiting, Northern Arizona. Mind turning out the lights when you leave? Arizona used their FCS neighbors to the north to dust off their record book and replace a few old numbers. The Wildcats came out struggling a bit, but then chopped down the Lumberjacks with a forest full of offense. While some alumni may not be proud of Arizona State’s consistently high party school ratings, the expectations for fun do translate very well on football game days. Tempe is a vibrant campus town that benefits from its big city neighbor, but radiates a character of its own. Eccentrically urban, Tempe is the ideal home for Arizona State. Perfect timing – Arizona State really needed New Mexico. The Sun Devils have had a sluggish start to their season, and for the past few years, finding the Lobos on your schedule usually signals an opportunity to find success and improve morale. Stanford – the in vogue pick. I admit that I became swept into the hype by putting them in high regard for a playoff position. Instead, a muggy day at Ryan Field became a potential Northwestern revival. Set in the Wasatch Mountains of Salt Lake City, over 600 miles from the Pacific Ocean, the University of Utah has made a comfortable home in the Pacific 12 Conference. Although some aspects of this area geographically feel out of place with the conference, the fan base and history of this team make it a perfect fit.